The best thing about the EZ Creamer is that it is extremely versatile. Not just a corn creamer, this machine will also cut, shell and even shuck corn! You'll no longer have any use for a traditional hand crank sheller. The semi-electric EZ Creamer is efficient and quick, making it the most productive and fastest residential corn creamer and kernel cutter on the market. Put up to 40 quarts per day! Made of aluminum and PVC pipe, the EZ Creamer is easy to clean. Its size is reasonable, so storing it during the off season is not a huge hassle. Included with the purchase of your EZ Creamer is everything you need to get started creaming, shucking and de-silking corn: mounting bracket and screws, creamer attachment, whole kernel attachment, 2 cob screws, silker attachment and instructional manual. 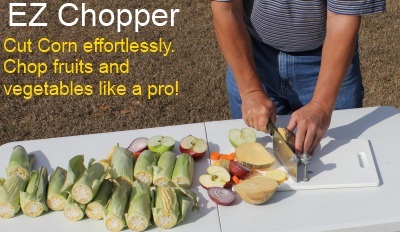 Check out the complementing EZ Chopper if cutting corn is always a chore for you. It makes light work of cutting off the corn cob ends, and can also be used to cut fruit, vegetables, and boned meat.